Read it on Apple News! Read it on Google News! As my husband, Cory, navigated the twists and bends that brought our rented Citroen from 90 kilometers per hour (56 mph) to 50 in a matter of meters, my eyes were glued to the hills beyond. We were honeymooners en route from Zagreb to Motovun in Northern Croatia and, two hours in, I became giddy when the first hilltop town came into view above the pastoral landscape. A stone church spired o’er the orange-tiled roofs of stone houses. Colorful laundry flapped on clotheslines, under the watchful eye of paint-peeled shutters. Further on, hilltops and lowlands were lined with orchards of light-green olive trees and majestic tracks of vine for Chardonnay and Malvasjia, a local specialty. Further still were forests brimming with Istrian gold, a buried treasure prized by Michelin chefs the world over. 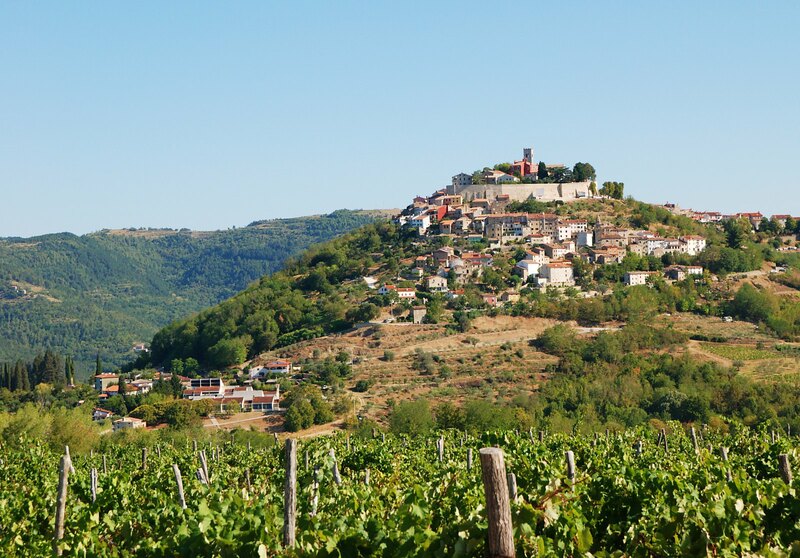 I was first introduced to Istria via a 2012 episode of Anthony Bourdain’s No Reservations. Bourdain had eschewed Croatia’s popular Dalmatian Coast and journeyed north instead to the Istrian Peninsula. He ate seafood in Rovinj, a fishing port in the coastal region known as Blue Istria, before venturing inland to Green Istria, the leg of his trip that intrigued me most. There, Bourdain dined on a meal of homemade pasta over which a white-gloved waiter grated fresh Istrian white truffles. This luxurious meal, in a medieval town nestled upon a hill, planted a seed in me. Croatia shares a maritime border with Italy and, with its vast groves of fruits and olives, and forests bursting with Istrian gold, it’s hard to deny Green Istria’s resemblance to Tuscany. Yet, as radio host and travel columnist, Brendan Frances Newnam, once proclaimed, Istria has everything Tuscany has minus the hordes of tourists. With this in mind, Croatia appealed more to my husband and me because of our off-the-beaten-track sensibilities. We wanted to experience Green Istria before it became overly-known and flooded with travelers. Beyond booking a cute, one bedroom Airbnb for less than $70 USD a night, we did not have much of an itinerary planned. We just wanted to explore the Tuscany of Croatia and maybe, just maybe, have a meal as delectable as the one Bourdain had savored years before. Green Istria’s fortified, hilltop settlements date back to the second millennium B.C.E., when they were settled by the Illyrians, who controlled much of the Balkans—from the Danube River to the Adriatic Sea—until the third century B.C.E., when the Romans took over and turned the area into a bustling trade route with roads, forts and thriving urban centers. In the thirteenth century C.E., Istria was annexed by the venerable Venetian empire for the next 500 years. Then it volleyed between a handful of European nation-states until 1991 when Croatia became a nation unto itself. Nowadays, Green Istria draws tourists wishing to feel what it was like to live in medieval times whilst indulging in modern gourmet luxury. When we arrived in Motovun, the most popular of the region’s hilltop villages and our home base for the next three nights, we had no option but to ditch our car in a gravel lot on the edge of a small cliff. After a short, steep walk on wobbly, cobblestone steps to our vacation rental, I was eager to throw down our bags and make our way to the top of the hill before dusk, to witness an Istrian sunset—with expansive vistas of valleys below me; and a plate of homemade pasta topped with local truffles before me. The air had the crisp freshness of a rise in elevation—Motovun is 252 meters (829 ft) above sea level—and as we trekked upwards to the centre of town, I could see why Green Istria is an ideal destination for active travellers. One need not walk far for a workout, as all the roads seemed to slope at a 45-degree angle. At what looked to be the main entrance to the town’s centre, a bollard stood guard to keep vehicles at bay, save a few locals’ vintage Peugeots. There, a tour bus was making a screechy, three-point turn while some of its passengers waited for the rest of their party to re-join them. Upon seeing the bus, I frowned; worried that we had missed the off-the-beaten-track boat . . . or bus . . . and the town centre would be swarming with tourists. Yet, as we made our way up a medieval corridor lined with centuries-old bricks, we passed only a handful of people on leisurely strolls. It was a cool and quiet late-September evening and, having inherited my mother’s predilection for al fresco dining, we made our way to Restoran Pod Napun, regarded for its homemade pasta and a terrace with sweeping views of Motovun and beyond. “This isn’t what I thought truffles would look like,” I said to Cory when our entrées arrived. The black truffles – or tartufi as they’re called here – were sprinkled atop my linguine in thinly shaved flakes. But, what do I know, I mused. I had only recently acquired a taste and inclination for the gourmet. At best, I could call myself an exploratory epicure. I have a penchant for the authentic, especially when travelling. Yet my palate was still in the process of becoming refined. Before we had stepped foot in Motovun, my only tartufi frame of reference was the truffle oil I had enjoyed on occasion back home in the States. Yet, as I took a slow, luxurious bite of a local black truffle, savoring its nutty, earthy flavor, I immediately understood why Bourdain had held truffle oil in such disdainful disregard in that No Reservations episode. “I have a mission in life,” he had said whilst savoring a cornucopia of pasta and Istrian ham topped with white truffles harvested hours before in the Motovun Forest. In truth, most truffle oils are comprised of olive oil or sunflower oil that has been infused with a chemical compound resembling the scent of an actual truffle. They are nowhere near the real deal and, as far as Bourdain and other chefs like Martha Stewart and Gordon Ramsay are concerned, truffle oil should be nowhere near anyone’s kitchen or palate. Authentic truffles are a globular fungus with a face only a troll mother could love. They grow exclusively in the wild, by the roots of oak trees in select parts of the world, most notably the forests of Italy, France and Croatia. They are foraged with the aid of specially-trained dogs and, in some countries, pigs. There are two types of truffles. Black truffles are mild, available year-round and are generally cooked before they are served. White truffles, however, are more nuanced, with a hearthy, garlicky and umami-tinged flavor that gourmands go gaga for. They can only be harvested in fall and early winter, are usually served raw and must be eaten within five days of harvest. Because white truffles are so rare and delicious, they are the most expensive food in the world. Italian white truffles have sold for as much as $150,000 USD for just 1 ounce. Yet in Green Istria, in September and October when white truffles abound in the Motovun Forest, one can savor an authentic, white truffle dish for the cost of a modest meal back in the States. I did not know this during my first Istrian meal with black tartufi at Pod Napun, but for just a few Croatian kuna more, I could have been savoring white tartufi and eating one of the best-valued meals in the world. The next day, Cory and I set out on a tasting adventure to experience Istrian olive oil and wine. Armed with a GPS and recommendations from the Istrian tourism office in Buzet, we drove to Torkop, an olive farm in the village of Sovinjak. Slowly and hesitantly, we pulled up to a homestead that looked in no way like it was in the habit of entertaining visitors. Laundry danced in the breeze before a family of apple trees. A canary yellow tractor and vintage Jeep were parked in front of a vast grove of olive trees. A dog barked somewhere in the distance. Nary a human was in sight. He nodded, then continued on into the house. “Is he going to get someone?” I asked Cory. Seconds later, two women in their early fifties emerged from the house. They barely acknowledged our presence as they shuffled into a shed nearby. Cory and I raised our brows at each other, then followed them inside. We were greeted by the sight of two, enormous storage tanks rising floor to ceiling in a back corner. This must be where the magic happens. One of the women opened the windows to breathe fresh air into a 70s-style tasting room that had clearly been shuttered now that high season was behind them. The other woman quietly disappeared, leaving us alone with the proprietress who silently poured two types of olive oil into mini, plastic shot glasses. We had begun to notice that locals over the age of forty-five, who did not work in tourism, were less likely to speak English. Thus, our conversation with our impromptu hostess was a series of pantomimes and occasional English words. I took a quick sniff of the first shot of yellowish-green liquid, noting an oily, olive-y scent, then sipped. Once I got past the slimy texture, I took in the deep, earthy flavor that tasted more like olives than any of the store-bought olive oils I used back home when frying eggs or sautéing vegetables. In fact, it tasted like something I could actually drink. “We made them open up, we better buy something,” Cory whispered as I reached for the second shot glass. I took a sip and after the initial butteriness absorbed, a peppery bite flooded my tongue. I had never noticed that kind of heat from olive oil before. It was a spice in and of itself. “I want that one,” I said pointing at the peppery oil. I was tempted to ask how it was different from the first but, alas, I did not have the Croatian vocabulary to do so. “Vino?” the woman asked, holding up an empty wine glass. “How is the oil produced?” I asked as I sipped a cold helping of crisp white wine. She looked at me and shrugged; yet another question lost in translation. “Flos Oleil!” she said, guiding me to a bookshelf where she began to thumb through a heavy tome. “I think they must be in there,” Cory said. “Oh yes!” was all I could muster as a response she would understand. Later, I would learn that Flos Oleil is a prestigious guide to the world’s 500 best extra virgin olive oils. In the 2017 edition, 61 of these oils hailed from Croatia’s Istrian Peninsula — the most of any nation. Not surprisingly, Flos Oleil has crowned Istria the World’s Best Olive Oil Region two years in a row. Unbeknownst to me at the time, we were standing in the rustic tasting room of one of the top olive oil producers in the world. That evening, having just enjoyed a light meal of Istrian prosciutto and olives at a terrace restoran in Motovun, we embarked on a leisurely stroll downhill, back to the cozy warmth of our temporary abode. Along the way, our eyes were drawn to a small restoran with whitewashed walls; a warm, homey vibe; and a charming name: Mondo Konoba. Delighted that he was adding a To-Do to our itinerary, since that was typically my role, I wholeheartedly agreed. The next night, we stepped into Mondo Konoba only to discover that indoor seating was by reservation only. Luckily, a young Croatian couple and their small dog were more than happy to share their six-top with us. We placed our orders and, as I sipped a glass of local Malvasjia white wine, I admired the black and white photos of patrons through the years. Then my eyes rested on a crudely framed photo above the kitchen. Cory whipped around and squinted at the photo of my buddy, Tony, being served by our very same waiter! Later, when our waiter reappeared with our entrées and a white tartufi in hand, my excitement magnified the moment I saw he was wearing a white glove, which protected the porous truffle from the oils of his skin. He set a bowl of pasta in front of me then, slowly and ever so gracefully, began to shave grayish-yellow tartufi flakes into the bowl, forming a perfectly delicious layer of Istrian white gold. Then he wished us, bon appetit, and glided away. I smiled at Cory with glee as I scooped a forkful of gold into my mouth. The slightly spongy pasta and simple white sauce paired perfectly with the cheesy, musky, garlicky and utterly delectable flavor of the truffle. I closed my eyes, lost in a gastronomical trance of nirvana, relishing each and every morsel of a luxurious meal that would end up costing us less than $50 USD. For Green Istria is a culinary gem that makes the gourmet accessible to all. “Oh yes,” I said, diving in for another round of nirvana. Elizabeth Doerr is a Portland-based writer and social justice educator. She’s spent most of her adult life looking for the next place to live or travel. During journeys abroad, she has been spellbound by the Northern Lights in Iceland; marveled at the engineering prowess of the ancients at Machu Picchu; and has a special place in her heart for Malawi, where she served as a U.S. Peace Corps volunteer for two years. Some of her favorite places on the African continent include the alleyways and pristine beaches of Zanzibar’s Stone Town; and the sky-high, orange sand dunes of Namibia’s Sossusvlei. She’s also a coffee-drinker; beer, wine and whiskey-lover; running-enthusiast; city-dweller; aspiring gourmand; and mama of a brand new baby boy. ... with our global community of intrepid travellers like yourself.